Ultrasonic Distance Sensor provides very short (2CM) to long-range (4M) detection and ranging. The sensor provides precise and stable non-contact distance measurements from about 2cm to 4 meters with very high accuracy. It can be easily interfaced to any microcontroller. 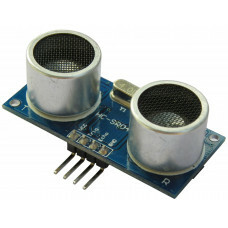 This ultrasonic sensor module can be used for measuring distance, object sensor, motion sensors etc. High sensitive module can be used with microcontroller to integrate with motion circuits to make robotic projects and other distance, position & motion sensitive products.